Businesses behave a lot like living organisms — they require fuel (cash); they have inter-dependent organs (departments and teams), and they have unique personalities (culture). Just like all living organisms, businesses evolve, they adapt to survive. Some do so effectively, others, not so much. Data: There is more information available than ever before. According to IBM, 90% of the data in the world today has been created in the last two years alone. This growth curve will continue to climb exponentially as they “Internet of things” movement continues and mobile devices become more ubiquitous around the world. Opportunities abound for those who seek value in this ever-growing resource. Applications: The shift to software applications, mobile or otherwise, is increasing accuracy and efficiency in all aspects of business. Improvements in software and the hardware that makes them usable have already transformed the world of business several times over. However, the new aspect of the trend is the ease of implementation and willingness of users to adopt new systems and the associated processes. Those who learn to take advantage of this trend can continually improve their sales conversion rates, boost operational results, and facilitate better financial management. People: Millennials will soon be the dominant “generation” in the workplace. Additionally, according to Accenture, Millennials will be responsible for 30% of retail spending by 2020. This generation, despite many of the widely held negative stereotypes, is wired to look for novel and innovative solutions. Businesses can find value in attracting millennials as employees and as customers. The phrase “That’s the way we’ve always done it,” is widely frowned upon and we praise companies who can implement change quickly and effectively. 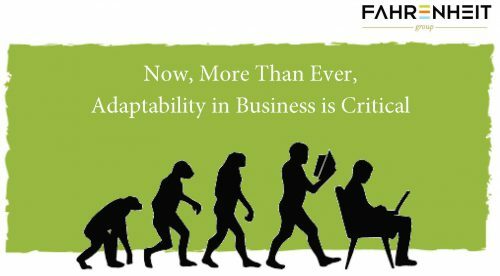 So why do so many companies struggle to grasp adaptability in this rapidly changing business environment? In other words, business leaders need fresh perspectives and new ways of thinking to truly harness the power of adaptability. This transition is a mental shift, not a tangible skill. My follow-up post highlights several ways that business leaders can shift their organizations’ thinking and cultivate adaptability. Jeff Wraley is a Senior Consultant on our Advisory team at The Fahrenheit Group. His technical ability and his experience in a wide range of industries have made him an asset to established companies, as well as early-stage startups. Please give Jeff, or any of our other experienced consultants, a call so we can help you with your financial and business needs. « How Can You Take Customer Service to the Next Level?